For the longest time Virgin mobile was the first and only virtual mobile network operator (MVNO) in South Africa. Over the last year and a half MVNOs have been on the increase, with pronounced activity and complexity in the range of the products and services they are offering to consumers. MVNO’s are generally not designed to challenge the larger incumbent operators such as MTN and Vodacom. Not even the smaller entrants may be threatened by them, which is why MVNO’s often utilise late entrants networks, providing them with a valuable wholesale revenue base, for which dominant players may not be sufficiently hungry. Targeting niche markets at various points of the income ladder or a strong clientele base makes it simple and potentially lucrative for retailers, banks or independent companies to offer mobile network services. In the first quarter of 2015 Me&You mobile, the latest MVNO, entered the cellular contract market with its unique, month-to-month, customer combined; voice, sms and data bundle offering. Me&You was followed by the entry of First National Bank’s virtual network. These two MVNO’s along with Mr Price Mobile are roaming on Cell C’s infrastructure. In order to better understand what it is MVNO’s are offering in relation to other operators in the market, Figure 1 plots all the products on offer in the South African contract market. It is clear that MTN offers the lowest value while spanning a range of different prices from high to low. Telkom mobile offers great value below R500 per month. Cell C offers great value on a few products below R1000 per month. Me&You mobile is the MVNO that offers the greatest value for products between R300 and R700. Table 1 presents a deeper comparison of the products of all contract offerings by South African operators. Contracts are grouped in ranges of ZAR50 at the lower end and ZAR 800 at the higher end to be able to compare the offerings of operators. The best value for money for each monthly contract range is highlighted in orange. Overall Cell C offers the highest value across all price ranges. 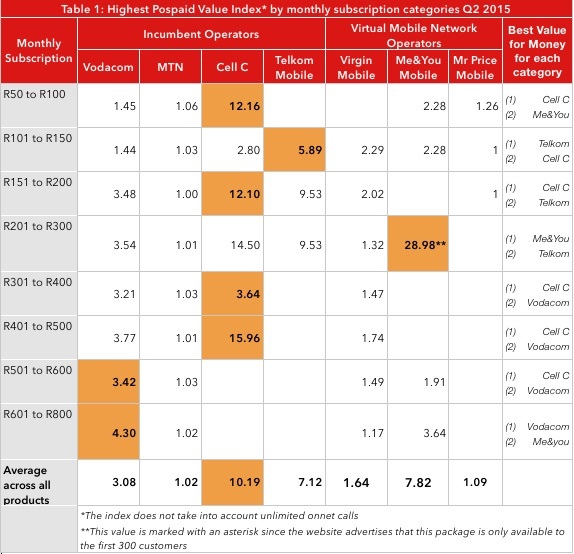 In the R301-R600 categories, Vodacom and Cell C offer the highest value offerings. 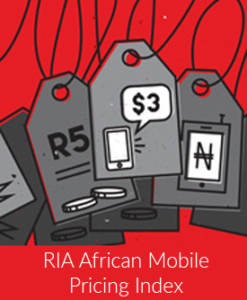 As far as smaller and virtual operators are concerned, Telkom Mobile and Me&You rank either first or second in terms of the value they offer between R50 and R300, and in the higher-end, R600-R800 bracket. This shows that these smaller operators, one non-dominant and one virtual, offer competitive bundles in the contract market. Me&You’s unlimited voice offering of R300 a month scores the highest value points on all products offered by operators in all price ranges. Me&You’s package offerings are designed to be tailored to consumer needs in terms of the number of minutes, data, and SMSes per package. Consumers build their own packages according to the value they want. Telkom Mobile offers the highest value in the price range R101-R150. 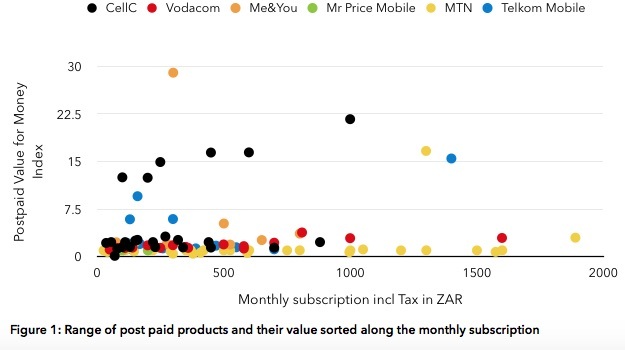 Mr Price Mobile and Virgin Mobile do not offer much value to consumers relative to other operators. Virgin Mobile presumably services a high end brand conscious consumer who is willing to pay a premium for the service. Mr Price on the other hand may be targeting a market that would not be able to gain access to devices through other credit systems. A question that may be important for consumers is what data quality they will be getting from these MVNOs. It is important to highlight that because FNB Mobile, Mr Price Mobile and Me&You mobile are roaming on Cell C’s network, the quality of the data connections they provide is unlikely to exceed the quality provided by Cell C.
So what makes smaller MVNOs unique and appealing to customers? Firstly, MVNO’s such as Me&You and Mr Price mobile have less onerous contract terms. Me&You contracts are for the most part SIM only and run on a month to month basis, as long as the customer has a valid ID and credit record. Mr Price Mobile allows for contracts to be renewed as early as six months prior to the full 24-month term if the consumer accrues loyalty points through the store. This differs from other networks, which allow upgrades to the device in the last two or three months of the contract term, but often subject to early upgrade fees. The loyalty points given by Mr Price could not be included in the Postpaid Value for Money Index. It is easy to see then that for lower cost plans, or for very specific needs surrounding convenience (contract exit), the need to be up to date with technology, unlimited voice minutes, or large mobile data requirements available on demand MVNO’s are there to cater to these needs.